And Suddenly, the Concrete Glows! (Zeltingen-Rachtig) Zeltingen-Rachtig, an unusual place for a festive award-giving ceremony from the Province of Bernkastel-Wittlich to the international artist R.O.Schabbach. Schabbach received the 2016 Culture Award at the foot of the new Hochmosel Bridge in Zeltingen-Rachtig. Governor, Gregor Eibes awarded R.O.Schabbach with this important, honourable Cultural Award on the MS “Eurpoa” cruise on the River Mosel, which was presented to him in the presence of ca. 100 high ranking political figures, decision makers and other VIP’s, who all paid tribute to the versatility of his artistic work in paintings, sculptures, world record winning Light Art Installations, etc. The highlight of the award ceremony on that evening was his monumental Light Art Installation for world peace on the tallest column of the Hochmosel bridge. It was a spectacular, colorful rush of Schabbach’s thematical art that made the pillar of the Hochmosel bridge come alive. In the past several years, the artist, has been more concentrated on his Light Art Installations, although his paintings and sculptures are still prevalent. In the spring of 2017 he also visited China and Hong Kong, where he is also having much success with his art. In the Vineyards of the surrounding of Zeltingen there were more than a thousand curious spectators from all over who had patiently & excitedly awaited the Monumental Light Art Installation for peace on the column of the Hochmosel Bridge to begin, according to Schabbach. Suddenly the spectators were prompted through an announcement to come directly to foot of the column, as the Light Art Installation was about to begin. With masses of people gathered around, the symphonic music starts & the Light Art Installation Monument for peace commences, in which Schabbach has specially composed & staged for this event. “I want to make art speak, it should be a sign of peace and I want to give back to the region,” says Schabbach. He donated the 3000 Euro prize money to the Mali-Hilfe, an association, which is committed to aid projects in the West African country, Mali. The masses of spectators gathered around the spectacular Light Art Monument on the bridge column and had felt animated to interact with the colorful Light Art Installation of Schabbach’s thematic art and were playfully & excitedly taking many photos and videos. R.O.Schabbach is going for his third World Record with his Light Art Installation on the tallest bridge of its kind in Europe, on the over 150.72 meters high gray column, says Schabbach. “I did not have the world record in mind when I initially created this Monumental Light Art Installation for peace, that I actually realized throughout my planning and conceptual preparation for this event”, he further said. This is R.O.Schabbach’s third World Record. His First World Record was made in Morbach-Hundheim, Germany, whereby he created a Light Art Scenario comprised of 115 buildings for world peace. 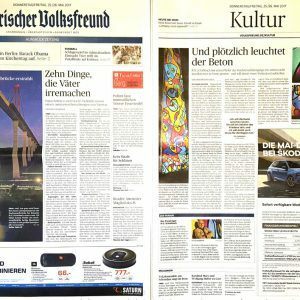 Schabbach made a good impression by proposing a daily one-hour Light Art Installation production on the Hochmosel Bridge with his brilliant art, he mentioned that it’s a very unique tourist attraction that was not available anywhere in the world. Without Schabbach’s suggestion, there would have been no plans for a viewpoint above the valley at the Hochmosel bridge, says the Secretary of State Peter Bleser. “Without your idea this would not have happened”, he says. We should be grateful to Schabbach for starting this initiative, he says. 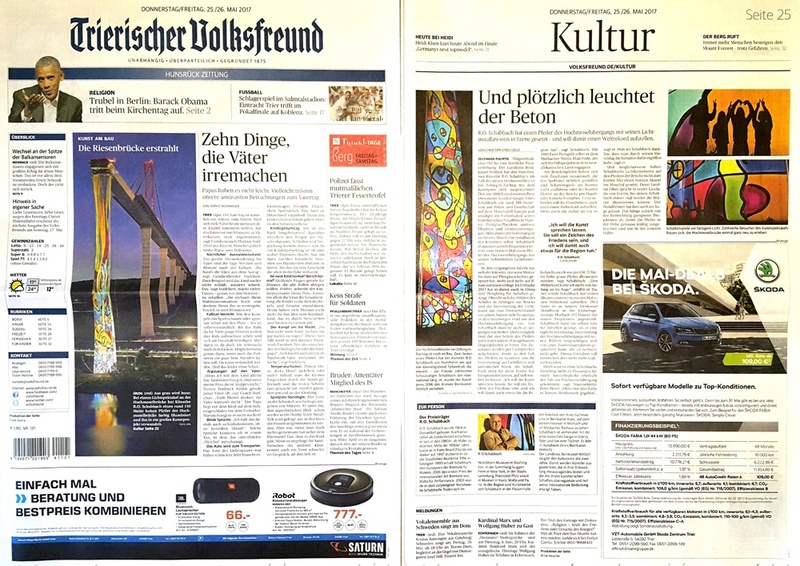 For sure Schabbach’s Light Art Installation on the columns of the Hochmosel bridge will continue to shine its light as an artistic, colorful tourist attracting high light in the Valley of the Mosel. Governor Eibes speaks in his laudation, of events where Schabbach could have a permanent Light Art Installation on the bridge. The Artist has already developed his own equipment and technology to realize this monumental permanent art project.